Today was another first for me in this amazing hobby. 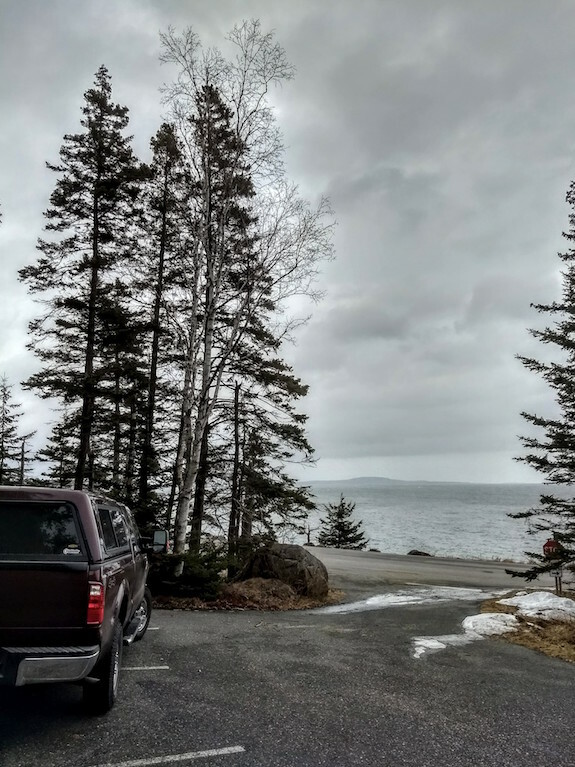 I was one of a handful of people at the most magnificent USA National Park east of the Mississippi River – Acadia National Park. There was no doubt in my mind I was the only amateur radio operator there planning to participate in Winter Field Day. 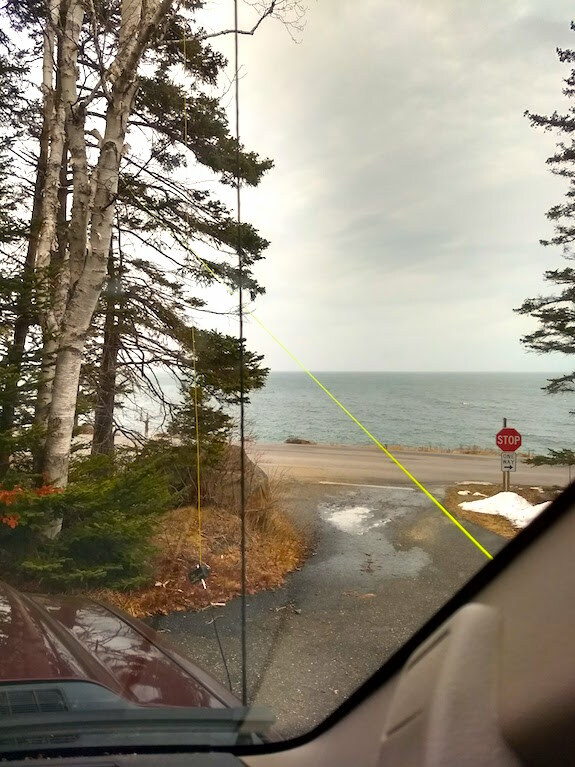 I decided to setup operations with a view to the Atlantic Ocean and found a deserted parking lot just south of the Gorham Mountain trailhead along the stunning one-way ocean drive. I was about one mile south of Sand Beach. 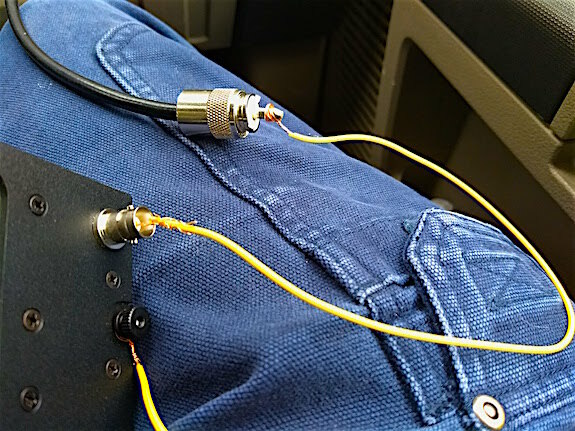 I thought that as I tried to rotate the outer ring of the male BNC connector to my Elecraft KX2. Normally the BNC connector slides on, rotates and locks into position. After two attempts, I took it off and looked at the end. I pulled out my Sog Flash II and proceeded to not only straighten the center core of the connector but then snap it off completely. It’s my favorite pocket knife of all time and I’ve yet to tame its power. It all happened so fast I was still in shock. Don’t tell me I’m not going to be able to get on the air! I didn’t have a spare PL-259 female / BNC male adapter even though there’s more than enough room in my Pelican 1200 case for one. Something inside me said to text my mentor Jim Cluett, W1PID. God does work in mysterious ways. Little did I know it but he was minutes away from walking out his door back in central New Hampshire to go on a walk with his lovely wife Judy. I moaned in the text what had happened and how my day was now ruined. Seconds later my phone rang. It worked! While it took about 15 minutes to get the right combination of folded wire strands to fit snugly into the female receptor on the side of the radio, it was worth it. I powered up the radio and it tuned perfectly on 40 meters. There were quite a few stations calling CQ WFD. It was time to hunt. 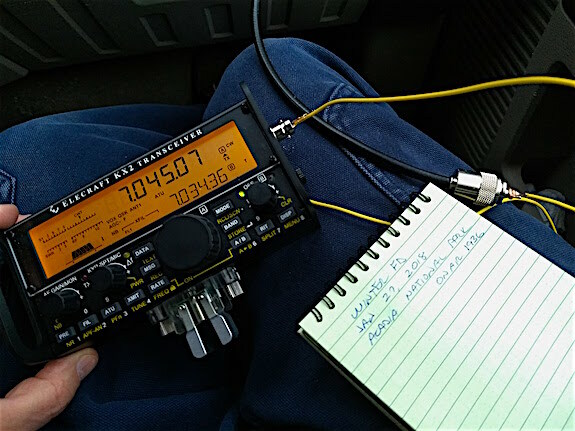 Within a few minutes I scored my first QSO and just over the border to Canada. What fun! After an hour of fun, I looked at my watch and thought I’d better break down. With the deep overcast, it was going to get dark in a hurry. Moments later my phone rang and it was Jim. I told him it was a successful day and that just three years ago I’d never have been able to do a contest like this. We both laughed quite hard. Jim can get away with ribbing me because he labored through the dismal times of me clawing my way up on the CW curve. He’s earned the right to poke fun so the memory of my single-digit word-per-minute (WPM) speed never fades. But now I’m not such a dreadful operator . Am I great? I think so but absolutely have a long way to go. Am I having fun and getting better each outing? Yes you bet I am. Fun and not getting skunked are my primary goals each time I operate outdoors. If I make it to 20 WPM some day, all the better. But by gosh bring spare parts next time! I’ve always wanted to master sending Morse code using a traditional straight key like the operators of old. It’s a deep-rooted feeling I’ve had for decades. 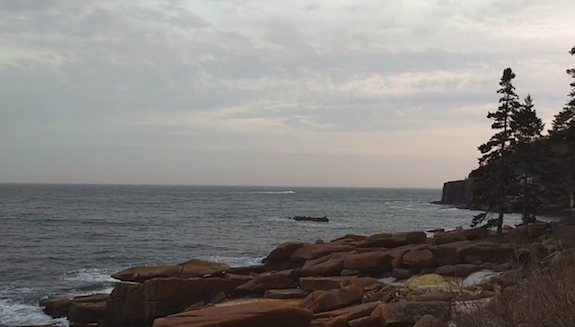 I started transmitting and receiving Morse code in the late winter of 2013. Jim Cluett, W1PID, has been my mentor on this magic journey. It all started on a frigid dark winter night in central New Hampshire at a Boy Scout meeting. I drove home alone from that meeting bound and determined to become a Morse operator. Little did I know how arduous the journey was to be and how many plateaus I’d rest upon as I transformed from an apprentice to a journeyman. I’ve use a Bencher paddle the past five years to send Morse. Paddles and the electronic counterparts in modern radios do all the heavy lifting when it comes to sending Morse. A point often overlooked is how they work together to create what I call droid code. It’s plain, it’s blunt and it has little character. Listen to a straight-key operator hold down the contacts on the last “dah” of the letter K and your head will be on a swivel. Sooner or later, the cadence of a straight-key or bug operator will be music to your ears. You don’t get much of that using a paddle. I’ve come quite far in my Morse journey. I could write about that for another hour. It’s important to realize that as you get better with Morse code, it’s like going up a set of steps. You work hard to get to a flat spot. The stairway is very long and I’ve got many more steps to take, but I got to a landing just three days ago when I dusted off my straight key and participated in the ARRL’s Straight Key Night. I was instantly hooked and Jim told me the next day about the K3Y SKCC event. The year 2016 was instrumental in my Morse journey. I was very active in the ARRL NPOTA event. Throughout the year I activated national parks in several states. On sacred and hallowed ground in southern Pennsylvania I managed a 90-minute CW pileup I had only dreamed of doing. For one thing when the event ended, I felt an emptiness. I loved the thrill of working a pileup. Last year I got involved in the Parks on the Air event to fill the vacuum. What fun I had! My most exciting POTA activation happened deep in the coastal redwood forest of northern California. I was at Mendocino Woodlands State Park. My takeaway from all those events was that if you want to get better at something, say using a straight key, then do it in a setting where it’s just for fun and there’s minimal pressure. That’s what this morning was all about. Just two days ago I signed up to do a one-hour shift for the K3Y SKCC event. I had a blast and worked 13 operators in an hour. Yeah, that’s a pretty slow pace, but it doesn’t matter. All that matters is that I had fun and my confidence jumped up to the next step. Be brave. Become an operator in a fun event to hone your straight-key skills. You’ll never regret doing it! Jim Cluett, W1PID, is my very good friend and amateur radio mentor. He always loves hearing how I harvest happiness from the hobby. Moments before I had just completed a fun conversation with Pete, AA2AD, in Pennsylvania using an old-fashioned straight key sending Morse code. The way radio communications were done one-hundred years ago. The American Radio Relay League ( ARRL) sets aside January 1 of each year to honor the deep legacy of Morse code and the humble straight key that was used by millions of radio operators through the years to send simple dihs and dahs. A dih is the short sound you hear in Morse code while the dah is the longer tone. Straight Key Night begins on New Years Eve in the USA because radio operators across the world use Universal Time, a modern name for Greenwich Mean Time. When it’s 0:00 January 1, 2018 in England on the prime meridian, it’s 7:00 PM ET here on the East Coast of the USA where I live. I started doing Morse code just after seeing a fun demonstration put on by Jim and another friend Hanz Busch, W1JSB, at a local Boy Scout meeting. I drove home that cold winter night determined to immerse myself in this legendary form of communication. I’ve always felt there’s magic in Morse. Believe me, there is. More than you can ever imagine. What does all this have to do with Straight Key Night you wonder? My straight key conversation, operators call them QSOs, with AA2AD gave me the same thrill a mountain climber must feel when she/he summits a particularly tough peak. Or the thrill a student must feel after winning the state or national spelling bee contest. Perhaps you’ve worked hard at some task that’s taken weeks, months or years and finally achieved your goal. You know the feeling. Straight Key Night is special because you cast aside your modern electronic keyers like you see Jim use in the video above. Most modern radios contain computer chips that create perfect spacing of the dihs and dahs. Some computer programs will send Morse for you through your radio if you just type the words you want sent. This is sterile and stale Morse in my opinion. Straight Key Night puts you into a time machine. You go back in time and send Morse using your brain and precise movements with your hands and wrist. Spaced bursts of electromagnetic energy are thrust up into the atmosphere awaiting someone to answer you. When they do, the fun begins. It’s important to realize that sending Morse code using a straight key is an art form. What’s more, it’s not easy to send Morse using a straight key if you do it just once a year. “No rust to my ears. HI.” Pete replied. The HI is a Morse acronym for laughter. Using my modern smart phone I touched the photo of Jim to call him about my QSO with Pete. I couldn’t wait to tell him how much fun I had. After all, Jim’s determination pushing me down the Morse pathway was directly responsible for my transformation into a somewhat respectable radio operator. The phone started to ring, but all of a sudden I heard through the radio faint Morse. Someone’s calling me! 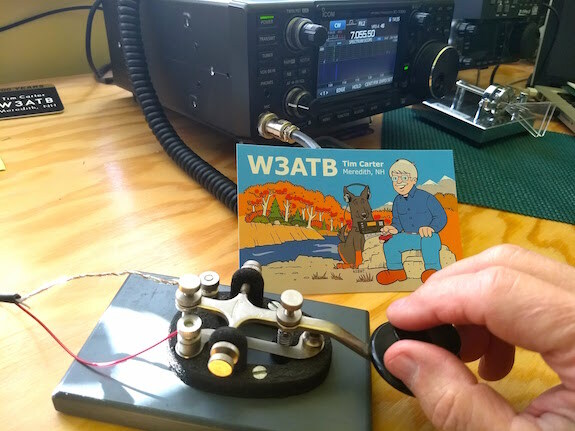 I immediately cancelled the call so I could converse with a fellow low-powered outdoor radio operator Craig La Barge, WB3GCK, who also lives in Pennsylvania. Twenty seconds later my phone started ringing. It was Jim. I sent him to voice jail so I could have an extended conversation with Craig. I finally called Jim after finishing up with Craig and we had a great conversation. I thanked Jim for exposing me to the magic of Morse and for his unending patience with me. Jim was so right as I noticed that when trying to speed up, I had a tendency to chop off the last part of a dah. My advice to you is to get out that straight key and scrape the rust from your fingers. Within minutes I’ll bet you have a wide smile on your face. If so, tell your story in the comments below to encourage other operators!